Sr. Cipriana grew up among a people belonging to an ancient civilization, the Incas, whose religious traditions contain an invaluable spiritual treasure. When she encountered the God of Christians, her life and that of her people appeared to her in a new light... the Bible became like a mirror reflecting their history. That experience prompted her to reach out to the poorest of the poor and to commit herself to their service. Good morning, Cipriana! You are from Peru, and more specifically a Quechuan woman from the Andes. Tell us about the environment where you grew up. I am from the small village of Yauri-Espinar located some 4000 meters above sea level. I was born and raised in the Andes cordillera, the nesting place of the condor, but also the location of the pampa, a vast plain in which vicunas and llamas thrive. Quechua is my mother tongue. Pedrona and Remigio, my mother and father, had seven children: five girls and two boys. I am the fifth child in the family. With the people of our village, we are a closely united community, rooted in the history and age-old culture of our ancestors, the Incas. We live in the cradle of the Tawantisuyo, that vast and fabulous empire built by the Incas. Cuzco, the ancient imperial capital and its surrounding areas preserve the vestiges of our cultural and spiritual heritage. The history of our Inca ancestors is woven with myths and sacred rites. From generation to generation, parents recount it at special events or at evening meals around the fire. This is how we preserve our traditions and our reasons for being, struggling and living for one another. The Incas revere a good God whom they call Taty Inti. He is not merely a star shining in the sky: this would not mean anything. He is the Transcendent One, the Living One. He has a heart, He has feelings. He is full of love! In our Andean religious experience, God is in everything. God is a mystery and cannot be reduced to a simple human expression. We have masculine and feminine names for Him, according to His many faces and manifestations .Thus, I, Cipriana, am a daughter of Father Sun, the Creator and Giver of life. I am also a daughter of Pacha­mama, Mother Earth, who never gets tired of giving us life, food and all that we see and admire. What was your journey of faith from the time of your childhood? When I was about seven, I left my father's home to study in the city of Arequipa. I lived at my aunt's house with my elder sisters who were also students. It was a round that time that I was introduced to the God of Christians. Until then, I only knew God according to his Andean face, the one of my ancestors and of my Inca culture. As I entered in a relationship with the God whom I was getting to know and pray to, I tried in every possible way to find out more about Him. I then started to search for God by reading the Bible. But all my efforts left me thirsting for more. So I wanted to provoke Him. I was still very young when Isaid to Jesus, What do you want of me? Why do you fascinate me so much since you know who I am? You know that I am not one of your people. Would you by any chance want me to become a religious, knowing perfectly well who I am? I tried to ignore this possibility and to find another way. And there was one. I remembe r that afternoon. It was the year when I turned 21. I was on the actual shore of Uchok 'arko River, feeling tired and exhausted. All of a sudden, I had the sensation of being all wrapped in love to the depth of my soul. It was Jesus! We talked for a long while ... I felt Him so close to me, to my people, my marginalized and exploited people. He was indeed the God of the whole universe! At that time, I was living in Yauri and teaching the children of surrounding villages. I started searching where Imight make my commitment. 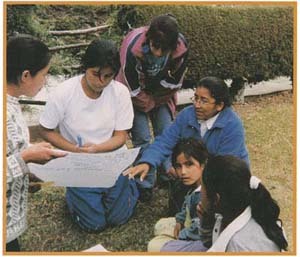 I first felt called to enter a brand new community of native Sisters in Sicuani, my native region. We received a formation as missionaries among our own people. For five years, this exper ience enabled me to share my most beautiful missionary dreams with the people of Espinar. Yet, this was not where God was calling me. So, I left for Lima in order to better prepare myself to help the people of my country. With all my heart, I wanted to help the poorest of the poor, wherever they were. That is what I was looking for the most. I was also very impressed by the work of the Missionary Sisters of the lmmaculate Conception in my parish. I was moved by their joy, their simplicity, their closeness to the people. I admired their audacity. We knew that they went to a silent place with their God to be at His total service afterwards. They strongly challenged me and unconsciously attracted me to their own adventure. And I thought, God has done so much for me... He gave me His life in abundance. How much He loves me though I am so little! For me to thank Him, there can be no better community than that of these Sisters who are dedicated to Thanksgiving. That is why I chose this community. What are the values of your culture that you can live out in Cajabamba? In Cajabamba, I mingle with country people and I consider it a privilege to be able to share all that makes up their life. Actually, we differ on certain points, for they are from the north of the Andes, and I, from the south. But we own the same values: community work, the joy of our feasts and celebrations, a close relationship with nature and a deep sense of religious reverence. Unfortunately, several values of our culture have fallen into oblivion since the Spaniards have imposed their culture on us. What takes place in the Bible study groups? I work in collaboration with the Centre of Latin American Bible Ministry in Peru and I draw inspiration from the method proposed for their workshops. Our goal is to bring the Word of God to the people and to help them live by it with love in the practical aspects of their lives. We also hope to lead them to discover and experience that God is close to them, that He listens to their cry and accompanies them in their struggles for a more just society. In my meetings with children as well as with adults, the first step is to help them discover that the Bible tells us the wonderful story of God's love for His people, and of the chosen people's love for their God. Since we too, are His people, our own life and our own history are mirrored there. My experience in Cajabamba leads me to give thanks. I admire how the people, simple and courageous, receive the Word of God and actually welcome God Himself present in their daily lives. I feel in solidarity with their sufferings and struggles. What a great mission it is to commit myself with them and for them, to God and for God!